How is the current Prince William related to King William III, who endowed the College of William and Mary in 1693? 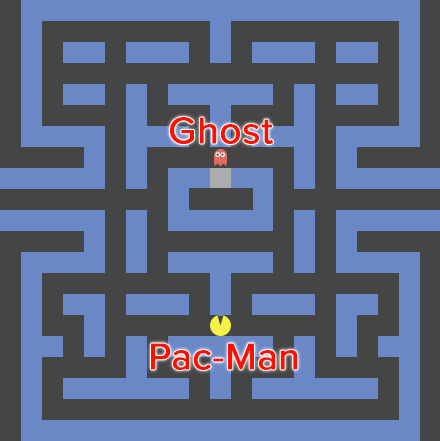 What path should a ghost follow to get to Pac-Man as quickly as possible? What's the best way to drive from Dallas, Texas, to Orlando, Florida? We have to be given some information to answer any of these questions. For example, a family tree of the royal family of Britain would show connections between people who were directly related. Prince William is the son of Charles Philip Arthur Windsor. Charles is the son of Queen Elizabeth II. 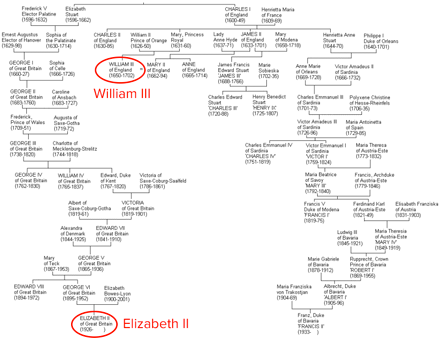 The problem is to find a short chain on the family tree connecting Prince William and William III, using these direct connections. As you can see from the tree below, it might take quite a few connections. For Pac-Man, we need a map of the maze. 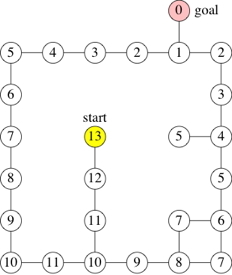 This map shows connections between adjacent open squares in the maze (or lack of connections, if there is a wall in between), and the problem is to find a path along black squares that leads the ghost to Pac-Man. 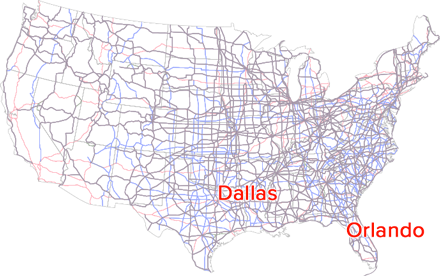 In order to find a driving route from Dallas to Orlando, we might use a map of the United States, showing connections (roads) between nearby cities. No single road directly connects Dallas to Orlando, but several sequences of roads do. Notice how the character moved to the goal? To make that happen, the program needs to determine the precise set of of movements that the character should follow to get to where the user clicked, and then animated those movements. There may be multiple paths for the character to follow, and the program needs to choose the best path of those. Before deciding on an algorithm, the movement rules first need to be established: Walls are made of gray squares, and legal locations to travel are empty. In each step, the character can move from one square to an adjacent square. This character, like a chess rook, cannot move diagonally. Start on the goal square. How far is the goal from the goal? Zero steps, mark the goal with the number 0. Now find all squares in the maze that are exactly two steps away from the goal. These squares are one step away from those marked 1 and have not yet been marked. Mark these squares with the number 2. Mark all squares in the maze that are exactly three steps away from the goal. These squares are one step away from those marked 2 and have not yet been marked. Mark these squares with the number 3. Keep marking squares in the maze in order of increasing distance from the goal. After marking squares with the number k, mark with the number k+1 all squares that are one step away from those marked k and have not yet been marked. There's a square immediately to the south of the start (row 4, column 3) that is only 12 steps from the goal. So the first move is "south." South of that square is an 11. South again. South again to a 10. Then east to a 9. East twice more to a 7, then north five times to a 2. Finish up by going west once, to a 1, and finally north once, to the goal.